For thousands of years, people have flocked to stadiums and arenas to see exciting live events, and in those thousands of years—virtually no major updates have been made. Whether an ancient Roman at the Colosseum or a loyal Cubs fan at Wrigley Field, the experience is more or less the same. You arrive at the venue, find your seat, then and watch the action in front of you unfold. Despite the massive size of these spaces and the immersive experience they offer, large-scale venues around the world are losing customers to two semi-recent inventions: TV and smartphones. Before the invention of TV, there was no other way to see a live event without visiting the venue in-person. Fast forward to the mid 20th century and most households have at least one TV. Fast forward a tiny bit more to present day and people have 60-inch High Definition TVs with a picture so clear you can see the blades of grass on the field. Combine that with a comfortable couch, a fridge full of preferred foods, plus a washroom with no lineup and it’s no surprise large venues are seeing a decline in patronage. Now smartphones mean today’s sports fan is no longer tied to their living room or the venue itself to get in on the action. Anywhere with a decent WiFi signal is all you need to see the game, instant replays, player stats, and even take part in multiplayer challenges. If there was ever a business ripe for digital transformation, it’s the sports stadium. Owners of these large-scale spaces know that they need to make a total transformation in the next few years to meet the expectations of its fans and to stay profitable. The biggest challenge is how to make the physical stadium part of the digital fan experience. Upfront costs: As the old saying goes, you have to spend money to make money. For some venues this is an acceptable loss, for others it’s simply not impossible. Even when the return far outweighs the investment, some venues simply cannot afford the upgrade. Retrofitting technology into huge footprints can be cost prohibitive. Additionally, many stadiums will limit their long term growth by only pursuing programs that solve a small slice of the fan experience such as mobile ticketing. Leadership alignment: Change comes slowly, especially if there is a large group of stakeholders. Naturally, any leadership team would be happy to make necessary updates to their venue, but the idea of a rocky transition that could decrease revenue is too risky. Organizations like Maple Leaf Sports & Entertainment Ltd. and Seattle NHL are solving this problem by bringing in digital strategists Humza Teherany and Todd Humphrey to lead the transformation. Integration: Many key players must collaborate to create a superior customer experience. Whether it’s ticketing partners, advertisers, POS providers, food providers, internal staff or otherwise: everyone involved must be aware of new technologies and resulting processes when updates are made to existing infrastructure. Today’s venues are looking for new ways to score a home run in customer experience. The kind of impact that goes beyond bigger jumbotrons and free swag. To do this, they need to provide their guests with a completely personalized, totally seamless experience that changes the role the physical venue plays. The good news is that cutting-edge technology is more attainable with every year that passes. The less-good news is that customers’ behaviour is constantly changing, and therefore difficult to predict. One solution that’s changing the game for venues of all sizes is indoor location technology. Indoor location anonymously understands a fan’s entire journey by looking at the presence of their smartphone. Indoor location can then be used to provide business intelligence metrics such as client journeys, how often they visit a concession stand, the traffic choke points. Indoor location also powers mobile apps to provide location, trigger messages and promotions, and help fans make decisions about where to go and when. With indoor location, venues with any size of budget can create a digital platform that delivers a never-ending list of benefits for their guests. Indoor location when put in the hands of the fan, can create an entirely new journey from the time they arrive to the time they head home. Parking: Notify guests about available parking. Help them find the nearest exit and of course, guide them back to their car after the game. Seating: Finding their seat is a cinch when guests are guided through the closest or least-busy gate, all the way to their seat. 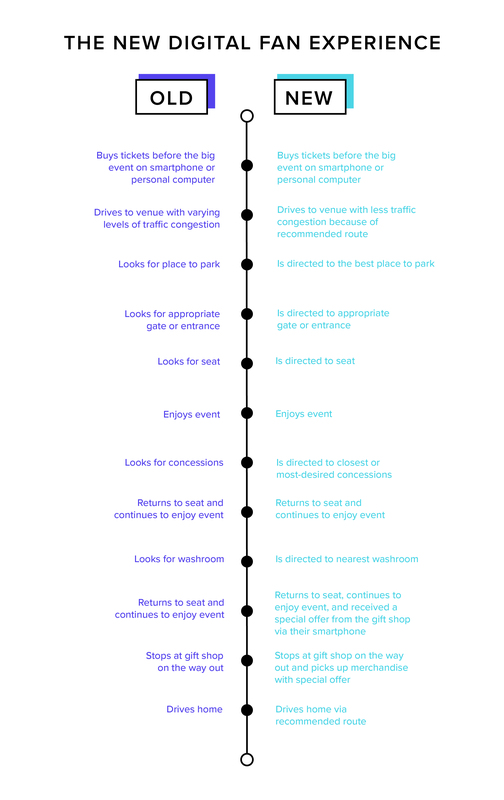 Concessions: Throughout the event, guests are notified about their favourite concession stands, where they are, as well as which ones have the shortest queue times. Bathroom breaks: Guests won’t have to miss too much of the action with washroom locations and wait times right at their fingertips. Special Offers: Once you know where your guests are spending their time, you can highlight offers that are more relevant to them. Now let’s take a look at some of the operational benefits of using indoor location for the business. Line busting: While a mobile app can help distribute where people go by driving consumers to less busy areas, the same data can inform staff to quickly implement line-busting strategies in real-time. Retail offerings: By understanding how many people visit different offerings throughout the venue, operators can optimize food choices, store layouts and ideally place pop-up offers while measuring overall performance and improving throughput for their fans. Cleaner restrooms: Automatically notify the cleaning staff of restrooms that have a high volume of usage and are in need of cleaning. HVAC: A digital, centralized system can detect malfunctions, redirect power if necessary, and even schedule repair, leaving your staff to complete other tasks. Health and safety: Something as small as a spilled beverage can mean millions in legal fees without something in place that can notify staff of issues requiring immediate attention. Venues that are already recognizing the digital revolution and changing the playing field to create a gold-medal-worthy experience. (Please note, these are not our customer, just awesome examples!). The challenge: Break records for fan convenience and amenities to drive sales and satisfaction. The approach: Create a custom app that delivers services such as ordering food, instant replays, and stadium mapping. The Challenge: In 2015, the Hamilton Tiger-Cats set out to transform their guests’ experience through several digital touchpoints. Personalized experiences: From purchasing tickets to stopping at the gift shop, each step of your guest’s experience must feel tailor-made to suit their tastes. Seamless wayfinding: Any time spent looking for amenities is time spent away from the event. Let guests know the best path to take to various locations and they will appreciate it. Dependable security: Both the guests in your venue and the infrastructure that supports them needs to meet the highest security standards. Efficient operations: Keep your venue working like a well-oiled machine with real-time oversight, decreased response time, and useful reporting. Ensured Sustainability. Ensure your venue is equipped for the long run by making upgrades that are technologically flexible and increase revenue year over year.